My heart pumped. A car swerved and parked just feet in front of me. The door slammed open and an older woman leapt out, speed walking toward the entrance. On their own volition, my legs moved quicker. I hurried through the door. Kitchen? Kitchen. Kitchen . . . hm, looked like it would be off to the left. The furniture in the living room and paintings in the dining room were a blur as I made my way toward the kitchen. Why the kitchen? Now's the time of year where the garden churns along on its own - mostly - throwing off a few tomatoes here, some squash there and I've been spending less and less time outdoors and more in front of the stove. A wanna be chef gots to have her tools! Ahhh, I reached the kitchen. I love these old homes with the not-updated kitchens. No gleaming stainless steel or glossy granite. The tile is white and clean. The painted cupboards are brightened by the glass knobs. A hand crocheted potholder hangs above the white Wedgewood stove. I eye the china but, honestly, I don't need any more. Instead, I opt for something more practical. A spring form pan. A large mixing bowl. Hefting the marble rolling pin off the counter, I silently kiss my BPA plastic laden one goodbye. 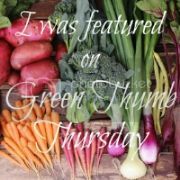 I sift through the cookbooks - pulling out a few delightful ones from the 1940s and a recipe folder of the homeowner's favorites, and head out to pay for my treasures. There's something about estate sales that tugs at my heart. The glimpse they provide into a past time, a life once lived, what was treasured, and what left behind. There's also the opportunity to fill one's home with wonderful reused items that hold the quality of well made items, before obsolescence became a marketing strategy, and as well as history. If you've not visited an estate sale before, it is definitely a different experience than a garage sale. The homes are often in original condition and tell a story about their owner. The prices may (or may not) be a bit higher and there are certainly more vintage items than the typical tag sale. Unless you're eighty, you'll probably not pick up a lot of clothes there but kitchen and garden items are usually in abundance as the older generation tended to cook and plant more. Vintage furniture - especially maple - is also often plentiful at such sales. Go early for the best selection. You sometimes need to sign up the night before or get there a half hour early or so and line up. Or, go the last day or the last half day for big deals. But back to me and my treasures. Once home, I'll pull out a recipe card - one dog eared and stained with butter and sugar. I'll roll out some chilled dough with my rolling marble pin. I'll dig through the cookie cutter box, filled with cutters from the century past. And I'll bake in good company. I love shopping at estate sales! They have the best deals plus very interesting stuff. So sweet! I enjoy sales like this. There's so much to imagine. Every item has a story. Hope you enjoy your rolling pin. I had one but gave it to a friend in the catering biz. I've got a very functional wood one that I like. The marble was just a little heavy for me due to an old (permanent) wrist injury. I love my marble rolling pin. My great grandmother gave it to me when I was a child (25 or 30 years ago?) My stepson insisted that he could roll out the pastry and dropped it on the floor. Thankfully he only broke the handle (glued it back together) or I would have broke down and cried. Daisy: That's what I love about estate sales - the story behind everything. Chile: Awesome! Gotta love the $1 bagel slicer. Billie: Thank goodness it was saved! That would truly be a catastrophe. I've never been to an estate sale before. I'm a little intimidated by it. But, you make it sound wonderful! "before obsolescence became a marketing strategy"
This planned obsolesce today is wasteful and not eco-friendly. We really have become a country of consumers. (Story of Stuff reference). We are moving to London in a month and I am so looking forward to estate sales there!